Not long after "The Sopranos" began airing, James Gandolfini remembers someone banging on the door of his Manhattan apartment late at night. Any blurring of the line between actor Gandolfini and troubled mob boss Soprano is understandable given the towering achievement of Gandolfini's performance, which resumes Sunday on HBO. The 45-year-old actor has portrayed the iconic criminal for eight years now, passionately channeling his similarities into the character. "I'm playing an Italian lunatic from New Jersey, and that's basically what I am," Gandolfini has said. The actor and character differ in many ways, of course, including their attitudes toward homicide. While Tony Soprano is a larger-than-life figure, Gandolfini is exceptionally modest and obsessive — he has described himself as "a 260-pound Woody Allen." He didn't begin acting until his mid-20s, then became a little-known character actor before "The Sopranos" made him one of the most recognizable faces in television history. Gandolfini is notoriously press-shy and declines nearly all interview requests — including those from The Associated Press for this article. His usual response is that there are so many other actors more interesting than him. But the man behind the mobster is far from boring — largely because of his unlikely path to stardom and his unique relation to it. Gandolfini grew up in New Jersey. His father was a building maintenance chief at a Catholic school and his mother was the cafeteria chief at another Catholic school. Both parents, having spent much of their childhood in Italy, often spoke Italian — though it didn't rub off much on their son. "My father always said a million times, `We're peasants,"' Gandolfini told Rolling Stone in 2001, explaining that he finds fame "ugly." "It's just a little odd for me, to get that slightly different treatment sometimes. And I'm uncomfortable with it. ... I want nothing to do with privilege." 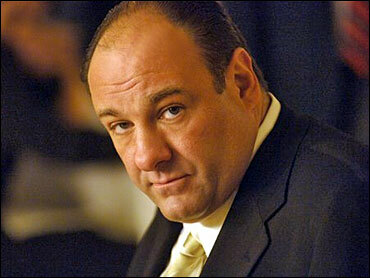 Gandolfini attended nearby Rutgers University and graduated with a degree in communications. When he was 19, Gandolfini's girlfriend of two years died in a car accident. He mentioned her in accepting his third Emmy, in 2003. "I might not have done what I've done" without her death, he told GQ, adding that the experience led him to seek a release through acting. He would later describe the reason he acts as to "vomit my emotions out of me." After college, Gandolfini moved to New York, where he worked as a bartender, bouncer and nightclub manager. When he was 25, he joined a friend of a friend in an acting class, which he continued for several years. Gandolfini's big break was a Broadway production of "A Streetcar Named Desire" where he played Steve, one of Stanley Kowalski's poker buddies. His film debut was in Sidney Lumet's "A Stranger Among Us" (1992). The role that perhaps most hinted at Gandolfini's talent for fusing violence with charisma — which he would perfect in Tony Soprano — was the tough he played in Tony Scott's 1993 film, "True Romance." In a memorable scene, he beats Patricia Arquette's character to a pulp while offering flirtatious banter such as, "You gotta lot of heart kid." Scott recalls Gandolfini's audition clearly: "You don't have to be a brain surgeon to spot someone who's got that much talent." "He's such a unique combination of charming and dangerous, and it's inherent in who he is," he said. The director, who also worked with Gandolfini in 1995's "Crimson Tide," recalled the actor's commitment, which included staying in a rundown motel to prep for "True Romance." "In both cases, he became the character," Scott said. "I wonder how much of (that commitment) is stealing his soul as he does yet another season, because I know how much he gives in terms of his self." Gandolfini continued with supporting roles in "Get Shorty" (1995), "The Juror" (1996), Lumet's "Night Falls on Manhattan" (1997), "She's So Lovely" (1997) "Fallen" (1998) and "A Civil Action" (1998). But it was "True Romance" that piqued the interest of "Sopranos" creator David Chase. "Some of the turmoil that's inside of Jim, that pain and sadness, is what he uses to bring that guy to the screen," Chase told GQ. Nobody was more surprised by the decision to cast him in the lead than Gandolfini. "I thought, I've never been the lead before. They're going to hire somebody else," he told Vanity Fair. "But I knew I could do it. I have small amounts of Mr. Soprano in me. I was 35, a lunatic, a madman." "The Sopranos" premiered in 1999 to immediate adulation, much of which praised Gandolfini's relatable performance as a mob boss who struggles with average problems. By its second season, "The Sopranos" was a breakout hit that would change the cable TV landscape and make HBO a revered bastion of creativity. His modest attitude set the tone on the set, said Steve Van Zandt, who plays Tony's consigliere, Silvio Dante. "He's so humble a cat. I think it probably came from being a character actor all those years, and being very surprised — openly surprised — to be cast a lead," said Van Zandt. "If HE'S not acting like a diva, nobody better act like a diva." But there was one notable argument between Gandolfini and HBO. Before production was to begin on season five in 2003, the actor threatened to leave if HBO didn't raise his salary. The network countersued Gandolfini for $100 million. The lawsuits were eventually dropped and Gandolfini, approximately doubled his salary of $400,000 per episode. Gandolfini's personal life also started to appear in the tabloids. Two months after the "Sopranos" premiered in 1999, he married public relations executive Marcella Wudarski. They had a son, Michael, in May of that year, and moved out of Manhattan into a five-acre New Jersey home in 2001. But in March 2002, Gandolfini filed for divorce. The proceedings dredged up allegations from Wudarski of cocaine and alcohol abuse by Gandolfini. In 2004, he became engaged to writer Lora Somoza, but the couple split in early 2005. The many breaks in the "Sopranos" schedule have allowed Gandolfini to appear in a number of movies, including comedies ("The Mexican," "Surviving Christmas," "Romance & Cigarettes"), an action movie ("The Last Castle"), the Coen brothers' "The Man Who Wasn't There" and last year's award-seeking flop "All the King's Men." All have been supporting roles — perhaps because playing Tony Soprano has taken up too much time and energy for larger parts, or maybe because Gandolfini remains committed to the character acting of his past. This month, his latest movie, "Lonely Hearts," will be released. Costarring with Salma Hayek and his friend John Travolta, Gandolfini switches to the other side of the law for the period crime drama. Writer-director Todd Robinson was impressed. "He said to me, `People try to rope me into their movies all the time. I almost always find myself pitching other actors that can do it better than me,"' Robinson said. "Acting is make-believe, but this guy believes what he's doing." The actor's biggest post-"Sopranos" project is a film about Ernest Hemingway, in which he plays the writer. That's no small task, but Gandolfini is clearly looking forward to new challenges and shedding the heavy burden that has been Tony Soprano. "It's been a great opportunity, but I don't have much trepidation about it ending," he told Vanity Fair. "It's more than time. Part of the fun of acting is the research, finding out about other people. As much as I've explored this guy, I don't know what else to really do with him. I've been in one place for 10 years. That's enough."